Celtic cuff links are rectangular shaped Irish jewelry for men that are crafted in sterling silver. These Celtic cuff links have been hallmarked sterling silver by the Irish Assay Office at Dublin Castle in Ireland. These Celtic cuff links in sterling silver are a rectangular shape that measure 3/4" wide x 3/8" tall and they feature a classic knot-work design . 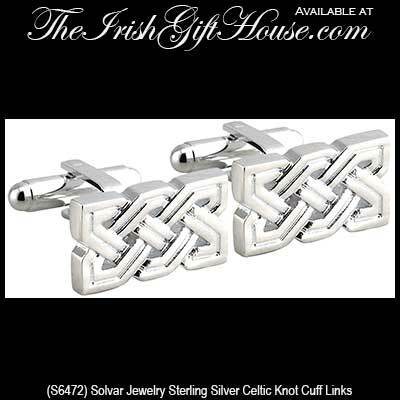 The double hinged Irish cuff links are gift boxed with a Celtic knot history card, complements of The Irish Gift House; they are made by Solvar Jewelry in Dublin, Ireland.